BARK!!! I got to go on a trip with mommy and daddy. I will take several days to share the time we had. They said we were going to MONTY RAY. First, mommy and daddy and their other pack ate a yummy smelling dinner a few days ago. While they got to do that, I had to stay in my safe place. Mommy said the food was too close to my level to let me hang out with them. When some of the pack left, daddy let me come out to get some lovins. I smelled all the yummies, but mommy told me to be good, since we were going to go for a ride in the Big Green Machine. So, after all the pack left, mommy and daddy started moving stuff around and then we all ended up in the machine and went for a long long ride. Mommy said we were going to make a stop in VIN CHURA. while daddy was taking stuff out of the machine, mommy took me out to sniff around. She told me to go potty, and I did, really fast like a good girl. It was cold. Then we went into this room, and it felt like it was moving. I got a litle nervous. And when the door opened, we were somewhere different. That was odd. When we got to a new safe place, mommy let me sniff around. There were so many smells. But I finally settled down when mommy and daddy laid down too. 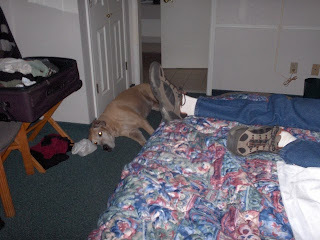 Mommy brought my bed, but I wanted to lay where I could keep an eye on the door and protect mommy and daddy. They said I was a good girl, with very few barks all night. The next morning we went for a ride again, and met some people that mommy called "Ant" and "Cuzin". 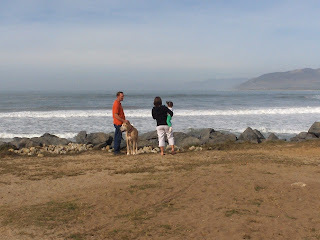 We were near a really really big water bowl, so mommy and daddy took me down to get a look up close. 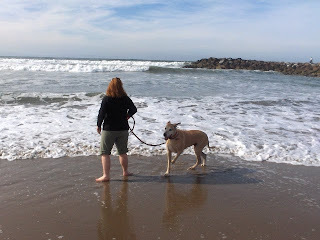 Daddy didnt want to get his paws wet, so mommy came down... and got wet with me. The water kept coming after me, then running away. I tried to get a taste, but it was AWEFUL!! spit spit ... Then they said it was time for another ride. 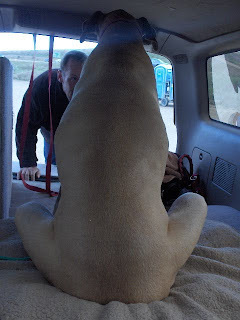 Daddy helped me up my ramp, and I settled in for the rest of the ride. 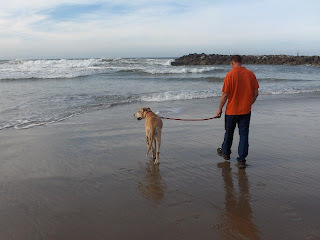 how do you get your danes by the water? 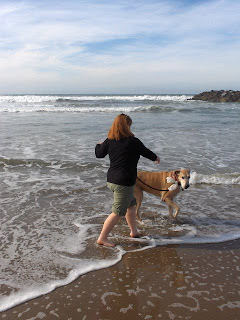 All three of ours are petrified of water. To even attempt baths is such a huge chore in our home!!! Isn't it spooky how you can get in the box on wheels and then when they open the door you are someplace entirely different? Sometimes that scares me and I don't want to come out, but you are very brave and adventurous.